Snapshot: The DeLonghi Nespresso Lattissima Pro EN750.MB is a capsule espresso machine with automatic turn-off function but no cup warmer. Can it make a good coffee? Tested using Nespresso Roma capsules. 28 Mar 2016, Phil I. Looks great. Nice and compact. Easy to use. I've really struggled to make good coffees with it. Milk frothing is automatic so there is not enough control. Never makes hot enough coffee unless you go to the effort of pre heating the cups. "This is a really good Espresso machine"
04 Feb 2015, Graham A.
I have owned a number of manual and semi-automatic espresso machines in my time. They are just too much hassle, you have to have fresh beans, you need an expensive grinder, the coffee has to be freshly ground, they take an age to warm up, you should throw away the first coffee you make each time. You throw out more coffee than you use, and the results are still hit and miss. With capsules you buy the strength you want, the result is always the same and tastes great. This machine gives a thick crema, it's always hot, and the milk frother is excellent. Strength can be as you want. The coffees are maybe 90% as good as a really good café coffee. But less than half of cafes make a really good coffee anyway, so for home this is tops in my books. "Better than what Consumer thinks." 31 Jan 2015, Russell H.
Easy milk frothing plus extremely easy cleaning of milk frother (just purchase a 2nd container direct from Nespresso and rotate them every 2-3 days - and it all cleans in the dishwasher). Consistent heat for coffee as long as you do an initial water only run (which also cleans it). 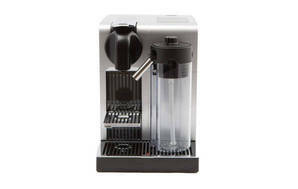 Does fill the drip tray faster than normal Nespresso coffee machine, due to steam created by the milk frother.